I wrote a blog post a long time ago called Come Expecting and what I wrote in there has rung through my ears quite a few times in the past few months. In that post, I more or less addressed the fact that I wasn’t always that great at coming to worship with the expectation that God would show up. I had seen the power of God really invade the services where people came prepared for an experience and that was an attitude I wanted to take on. I’ll be honest with you: here I am, months later, still having to work on that. And now that post rings through my ears once again as I read Frank Bartleman’s Azusa Street. Now incase you didn’t know, Azusa Street was a big revival out in California in the early 1900’s and Bartleman was apart of it. In his book, he recalls the events leading up to the revival and the revival itself. Now I’m not even sure I agree with everything Bartleman has to say, but let me tell you one thing for sure: this guy was sold out for Christ. His opinions are highly charismatic and sometimes it seems that he goes a bit over the top (or maybe I’m just a bit close-minded), but all of his beliefs stem from an intense love for God. Anyways, I did bring up that old blog post for a reason. See, I believe that part of the reason Azusa Street really got going was because of intercessors like Bartleman. The whole first chapter of his book is about what happened before the revival took place and much of is personal stories of himself engaging in prayer. There are also stories of a group just pushing into worship and coming time and time again to meetings where they maybe didn’t even know what to expect, but knew that there was in fact something to expect. He also spent time writing the leaders of the revival that had been happening Wales, asking them to pray for what they were experiencing to happen in California. It’s funny too, because Bartleman described Wales as a place that “expected from God” (22). Through a passion for prayer and much, much more, I believe God heard the area’s petition and sent revival to them. I couldn’t believe it, but I actually found it startling to pray for others. I realized that so much of my prayers as of late had been for myself, services, or organizations. I mean, I suppose I was still praying for people here and there, but they were usually coming up to me for prayer or I was recognizing in the spur of the moment that I should pray for them. But to actually stop for a moment and think about people I could pray for outside of a service or the spur of the moment really did catch me off guard. That’s something else I need to work on, especially since I find myself going through the daily liturgy thinking, “I wonder if today’s liturgy is going to have me pray for people right now.” Praying for others takes time, focus, concern, and empathy and sometimes quite a bit of effort to get to that place. I don’t even find myself taking a lot of time out during that part of the liturgy, but the concern for it that I have now is at least a bit more significant than it was and will hopefully grow stronger each day. Okay. That’s enough honesty for today. For more thoughts on intercession, check out Beni Johnson’s book, The Happy Intercessor, or check out a previous post I made on the topic. Also, I’d like to say good morning Justin. Liardon, Roberts, and Frank Bartleman. 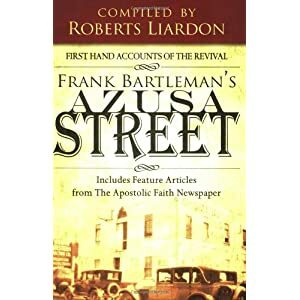 Frank Bartleman’s Azusa Street: Includes Feature Articles from The Apostolic Faith Newspaper. Shippensburg, PA: Destiny Image, 2006. Print. A story of the presence of God within any group of christians. The presence that convicts and gives grace.